Do you have great content on your blog but are having trouble getting people to view it? I have a solution that’s worked very well for me to get high-value people to read and engage with my blog content and it’s an easy campaign to build. 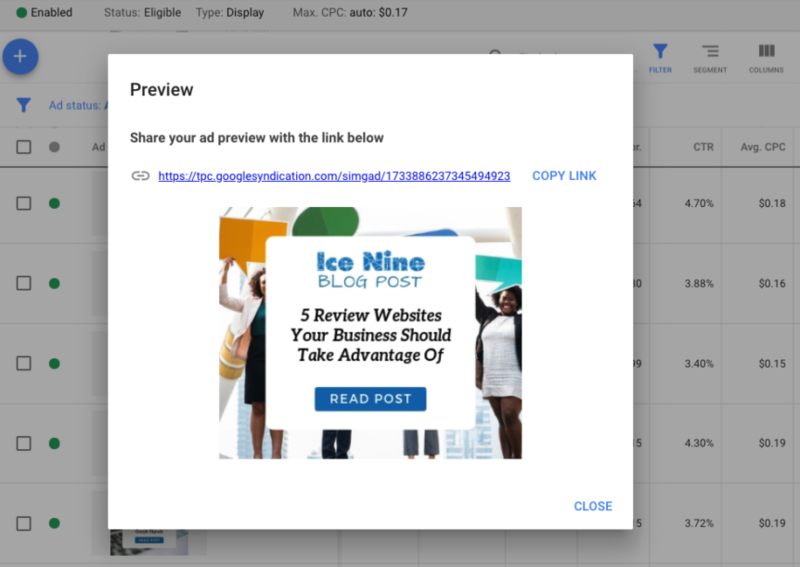 Create a Google Ads Display remarketing campaign targeting people who have already been to your website (or just your blog, if you have decent traffic) and show them display ads promoting your blog posts. I typically will create an ad group with 8-10 ads each promoting a single blog post and set the ad rotation to “Do not optimize: rotate ads indefinitely” so your audience will see all your posts, not just the most popular post over and over again. The ads are very cheap (since it’s Display/remarketing). I pay around $0.17/click. I get a CTR of ~4.2% for this campaign, which is very good for a Google Ads Display campaign. The people you are targeting are high-value (they are already interested enough in you to have visited your website or blog already) and for B2B lead-generation it’s a much more effective campaign than push-based messaging: you are providing value with nothing expected in return, building trust with your audience. Sample ad for this campaign.